One of my K9 partners who was Patrol and Narcotics trained. Not a Bomb Dog. We responded to a bomb threat last week. Having an explosives detector dog at the scene reminded me of a call years ago when I was a K9 handler. It was the early 1990’s. I was working a dual-purpose Patrol and Narcotics K9 on the Midnight Shift. A woman called 911 to report that she was having a domestic with her boyfriend. During the argument, he threatened to blow her and her whole family up. Prior to our arrival, she told the dispatcher that he had left their…wait for it…mobile home with something under his shirt. Officers arrived on scene and she disgorged that he had previously served in the Marine Corps and knew something about explosives. While we were speaking to the woman, the male arrived back at the trailer. He consented to a pat down. Nothing on him. We questioned him about her assertions. Of course, he did not know what we were talking about. I turned to the sergeant on scene. I had a brilliant idea. No, my dog isn’t a bomb detector, but if the man hid something in the darkened mobile home park, I could follow his track with the dog and find anything he might have secreted that had human scent on it. The sergeant was skeptical. Seriously, I told him, I’ll be careful and keep the dog on a short leash, as it were. Back in the day, K9 Narcotics Detectors such as mine were “aggressive alert” dogs, meaning that they were trained to scratch and bite at the source of the narcotic scent and alert the handler to its presence. Nowadays, Narcotics and Explosive Detector Dogs are taught to “passively” alert by sitting upon finding the source of their respective target odors. Midnight Shift has a way of sometimes distorting the lens through which common sense is clearly seen. Sure, said Sarge, give it a shot! Off I went to the truck to get the dog. I hooked him up to a 6′ lead on the dead ring of his choke chain and took him to the rear of the trailer. Presumably, the man had gone on an “out and back” path to hide his burden, since he was not gone long. Down went the dog’s nose and he began casting back and forth along the trail. I normally deployed the dog for man-tracking on a 15′ heavy nylon lead. This time, I stayed close behind on the much shorter obedience leash. That first K9 of mine was easy to read when he was on task. I knew we were solidly on this guy’s track. So much so, I kinda forgot what I was doing. As we navigated between the trailers and across a small courtyard, I let the dog get all the way out on the lead. The dog’s head quickly swung to the left behind a pine tree and he cocked back his right paw. Neinnnnn! He jabbed. I saw something fly through the air, so I pulled the dog back. He looked proud to have won the game and found the toy. It lay in the grass. A Tupperware container. Faded red lid, clear plastic lower. It had rectangular blocks of something in it. They were wrapped individually and said C4. Ohhh, Sergeant! The Sarge sauntered up. I looked a little green. He examined the container from a distance, then moved slowly forward. He let out a big belly laugh. “Its training C4!” he chuckled. Sarge was an old Vietnam vet and 20 year copper. He’d learned a thing or two. He suddenly stared sharply at me. I shrank down a bit, making myself a smaller target. He just shook his head. I scurried off to the truck with the dog. 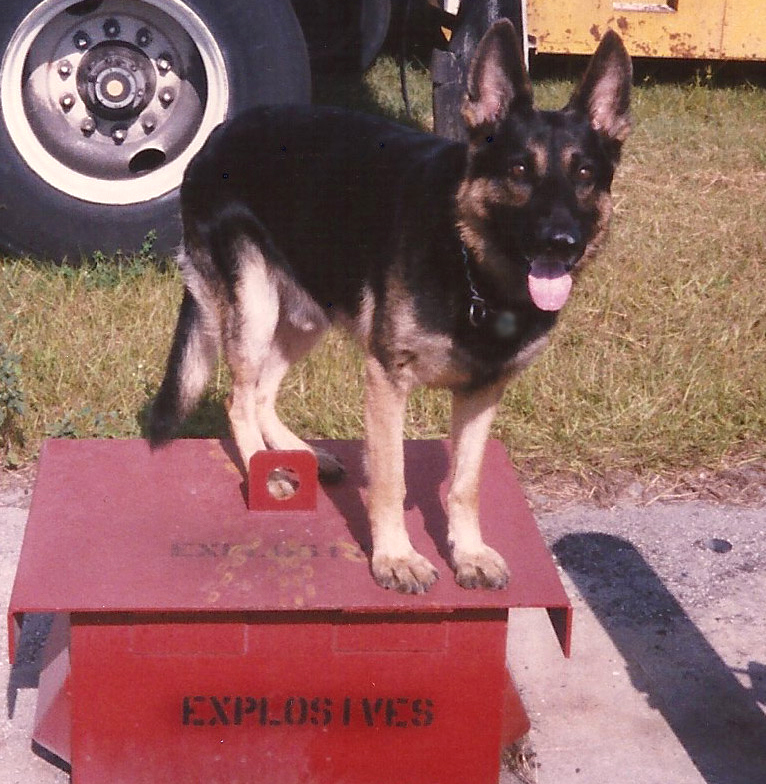 This entry was posted in Humor, K9 and tagged K9 Explosives Detector Dog, K9 Police Dog, Narcotics Detector Dog, Police K9. Bookmark the permalink. The K9 did a great job anyway LOL! He sure did, Steve! I have found that many times the problem is at the other end of the lead!